AKA, a list of really solid albums that (also) should have made the top ten list. Deathcab for Cutie – Kintsugi (iTunes | Spotify) I tend to like Deathcab for Cutie best in their more stripped-down, sparse moments… along these lines, I’d consider Transatlanticism and Narrow Stairs their best work. Those albums had catchy pop, but stayed a bit rough around the edges. In their first album without Chris Walla, Deathcab went the other direction with a much more lushly-(dare I say over)-produced sound. So, while it’s super-slick, I don’t think it rises to the level of their best work. Still, it’s a worthy addition to their catalog. It can be a little syrupy at times, but is always poppy, hooky and catchy. All said and done, I recommend avoiding comparisons to Transatlanticism/Narrow Stairs (or even the poppier Plans) and just enjoy it for what it is: the smoothest, most polished, most guilty-pleasure Deathcab for Cutie album. Modest Mouse – Strangers to Ourselves (iTunes | Spotify) Strangers to Ourselves could be accused of being paint-by-the-numbers Modest Mouse. However, paint-by-the-numbers Modest Mouse is still a lot of fun. Isaac Brock still can’t sing to save his life. There are plenty of off-beat, weird songs; and plenty of infectious, catchy hooks. It’s nothing new, but it’s Modest Mouse doing what they do best. Wolf Alice – My Love Is Cool (iTunes | Spotify) Grungy rock and just a hint of chill trip-hop are perfectly mixed in this album. It’s sometimes heavy, sometimes soft and occasionally a bit of both. From the haunting opening track to the end, this album grew on me after a few listens. 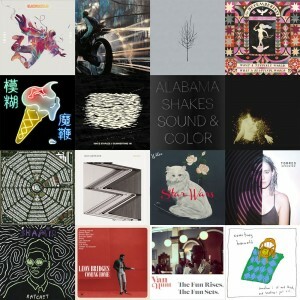 Alabama Shakes – Sound & Color (iTunes | Spotify) I liked the first album (Boys & Girls) by the Alabama Shakes quite well, but it seemed a bit too much of a retro “genre” album. The sound was classic, but seemed a bit like it was trying to sound intentionally “classic.” Sound & Color has much of the same classic sound, but it seems much more natural. Where Boys & Girls sounded retro, Sound & Color sounds fresh and modern with a classic sound. Vince Staples – Summertime ’06 (iTunes | Spotify) Vince Staples was a new name to me, but I’m really glad to have been introduced. This is smart, moody hip-hop at it’s best; with well-constructed rhymes over rich, atmospheric backing tracks… well-crafted and catchy! Blur – The Magic Whip (iTunes | Spotify) A lot has happened since the last time Damon Albarn and Graham Coxen teamed up. For one, Albarn’s numerous solo and side projects… most notably the Gorillaz. Albern’s diverse musical styles have been brought introduced into this new Blur album, but it’s still recognizably Blur. Blur has never stopped evolving its sound and this album is no exception. The Decemberists – What a Terrible World, What a Beautiful World (iTunes | Spotify) This album doesn’t have quite as much personalty as many Decemberists albums before it. No eight minute sea songs about being swallowed by a whale; no rock-opera concepts… this album doesn’t have the normal dose of Decemberist weird. However, it probably has some of the most polished songwriting of the Decemberist’s career and is musically diverse. Low – Ones and Sixes (iTunes | Spotify)I liked Low’s last album, The Invisible Way, but found it a touch forgettable. However, Ones and Sixes got under my skin. This is great late-night music layered with infectious, haunting melodies. It’s quite and slow but also dark, moody, beautiful and surprisingly catchy. Blackalicious – Imani, Vol. I (iTunes | Spotify) Blackalicious hasn’t come out with new music for a while, but this one is 100% solid… perhaps even better than Blazing Arrow (debatable). In any case, it shows that they haven’t lost a step. Thanks for checking out my list. Hope you enjoy!